‘Indiajoy 2018’ will feature 15+ events, 25000 delegates, 300 exhibitors, 500 speakers from 30 countries. 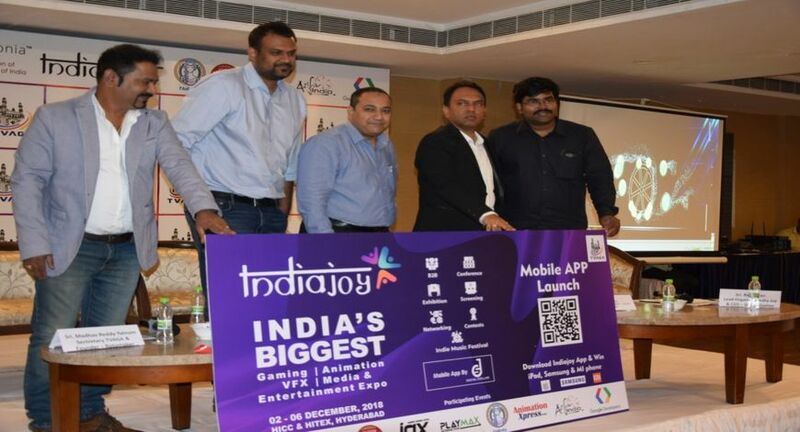 Asia's biggest gaming plus media & digital entertainment content Expo, ‘IndiaJoy 2018’ will make its debut at HICC and HITEX in Hyderabad. The 5-day event supported by Government of Telangana and facilitated by Telangana VFX, Animation & Gaming Association (TVAGA) is divided into B2B area for business, B2C for gamers during December 2nd - 6th. “It is a delight to share with you, in the debut year, IndiaJoy 2018 expo is attracting wide participation from industry leading names. Spread across several square meters, the event will host 15+ events, 25000 delegates, 300 exhibitors, 500 speakers from 30 countries,” said Madhav Reddy Yatham (Mike), Secretary TVAGA & Founder, Rotomaker. The Gaming, Animation Digital Media and Entertainment week will kick off with Asifa CG Meet up on 2nd December. A series of daylong events on 3rd, 4th, 5th and 6th December, featuring Google Day (Indie Game Developers Day, Animation Express-Investor Connect are other highlights of the event. With markets like India, Asia-Pacific is home to the fastest-growing games market globally. Driven by increased smartphone adoption, better internet infrastructure, and competitive and immersive mobile games, these markets have boosted the region to capture 52% of the global market.